We are on week number 4 of this 6-week event. 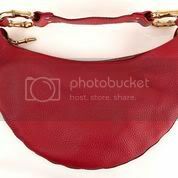 This week you have a chance to win a red Gucci Leather Hobo Bag worth $1500. 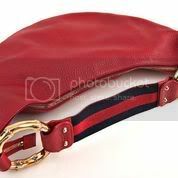 There will be one designer handbag given away every week! Each bag will be an authentic, recognizable designer brand such as Gucci, Louis Vuitton, Coach, or Fendi.Our 6th week will feature a highly coveted designer handbag and you will have the option to claim bonus entries for each of the 5 weekly “Win This Bag” giveaways you entered leading up to this grand finale!So, enter each weekly giveaway to increase your odds of winning! 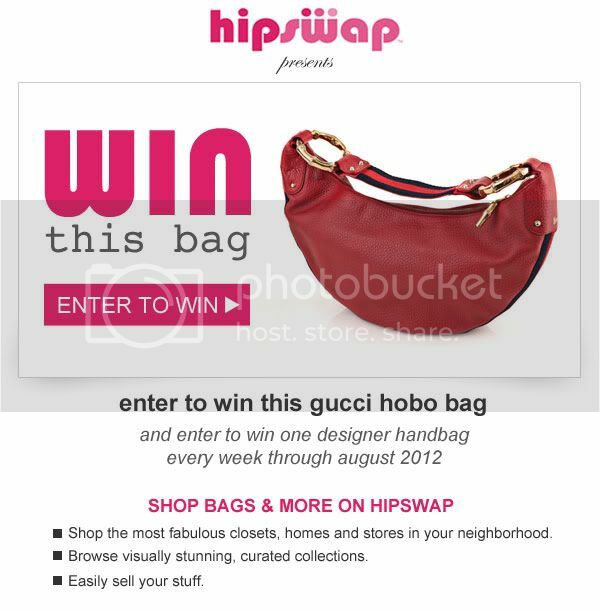 Thanks to HipSwap, you have the opportunity to win the exact bag that may have been on the arm of a famous celebrity! 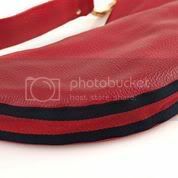 Also, be sure to swing by the HipSwap blog to check out their ever popular post on how to spot a fake Louis Vuitton bag! Now, on to this week’s Giveaway! 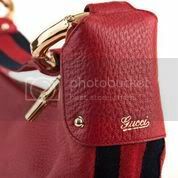 This week, you have the chance to win an authentic Gucci bag! 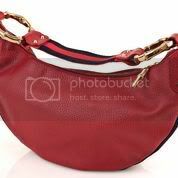 This red-pebbled leather Gucci hobo bag is amazing for any occasion. 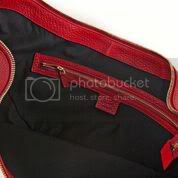 It Features a navy cotton stripe in front and large gold ring hardware at strap ends. 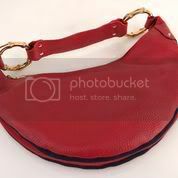 This beautiful handbag was provided by the amazing DoubleTake Consignment Boutique of New Jersey. The DoubleTake Consignment Boutique first opened its doors in Short Hills New Jersey in1992 and from day one the store has been packed with women who understand the advantages and value of consignment shopping. DoubleTake, which only accepts the highest quality & current designer clothing and accessories, has been recognized as a unique clothing boutique where huge savings can be realized. 1. Create a HipSwap account.You will be asked to enter your name, email and zip code. If you do not live in the United States, please enter your City and Country in the Zip Code field. There is only one mandatory entry option and that is to create a free HipSwap account. However, by entering on this blog through the Giveaway Tools widget below, you have the opportunity to gain a large number of bonus entries! You can complete as many or as few bonus entries as you’d like but remember, the more you do, the better your odds of winning! Plus, once you are following all of your hosts, entering each subsequent weekly Win This Bag Giveaway will be even faster & easier! And, don’t forget – we’ll be offering even more bonus points for each of these giveaways you entered during our final week of this event! Giveaway begins on 7/17/12 at 12:01am EST & ends on 7/23/12 at 11:59pm EST. The Giveaway Tools Widget will load below this line. For those of you not familiar with Giveaway Tools, it is VERY similar to Rafflecopter but has been said to be a faster & easier way to enter giveaways. Let me know what you think! 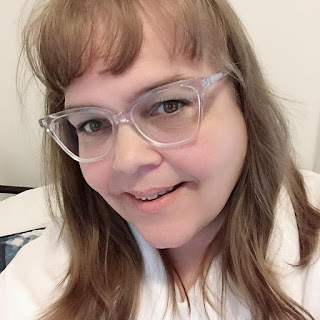 As always, thank you for visiting my blog and entering our giveaways! Good luck to you! This giveaway is open to entrants worldwide 18 years of age or older, except where prohibited by law. No purchase is necessary to enter. Void where prohibited by law. The odds of winning are based on the number of entries received. This promotion is no way sponsored, endorsed or administered by, or associated with, Facebook and is Facebook-compliant. To qualify to win, you must complete, at minimum, the mandatory entry on the Giveaway Tools form. All entries will be forwarded to our sponsor for the purpose of randomly selecting a winner. Winners will be notified by email from a HipSwap representative. Winners will have 72 hours to respond or risk forfeiting their prize. Prize may re-awarded solely by the Sponsor’s discretion. Prize fulfillment is the sole responsibility of the sponsor. This blog may not be held liable for Sponsors who do not fulfill prize shipments. The participating bloggers were not compensated for this post. We reserve the right to publicly publish winners’ names and/or likeness. By entering this giveaway, you are agreeing to these terms and conditions.